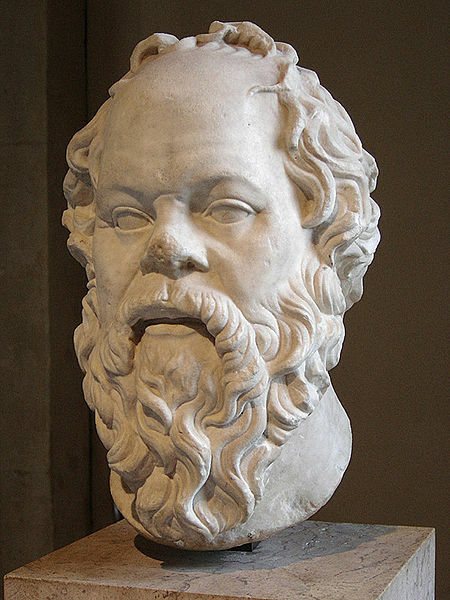 "Hey, College Boy, what do you know about Socrates?" That story he told about one of the summers he'd been working on the grounds as a way to pay off what his swimming wouldn't. That's how the scholarship worked. You swim to win because it pays for your books. He swam. He won. He paid for his books. If he didn't swim, he couldn't win. And then no one would pay. So, he swam. On and on. One summer, way back when and someplace else I've never been, he was stopped by the old man, the full-time groundskeeper. Full-time meant there for life, as part of the institution, exactly where he wanted to be. Where he was stopped by the groundskeeper, the old man. That's when the question was asked. "Hey, college boy...." well, you know the rest. As it turns out, that old man who pretty much knew how to wield anything with a handle... that old man also knew a lot about Aristotle. And a lot of other stuff that you might like to think you knew a lot about too. College Boy suspected Old Man had been seduced by Clio. Suspected, though it was obvious by the stacks of books he had managed to neatly cram into his living space. College Boy said they were everywhere, the books... in huge stacks. One time when he was visiting for a cup of conversation, you know, just checking in from time to time after summer had finished.... one time, he said that he noticed Old Man kept books in his oven. He lived off the words, devouring them. Everywhere he looked there were books, nothing but books, all the way down. Clio, she had whispered in his ear, seduced him. That's the way College Boy told it. You wanna know how? Well, he's gonna tell ya' anyway. College Boy was wondering back into archives, maybe late one day, actually thought he looking for something. Clio teased the dust off the top of one of those old tomes as the boy opened it, firm and gentle hand holding her straight back, bound by the feeling of firm spine made supple, sliding index finger between silken pages...she knew exactly what she was doing when she blew his mind. He could never leave her. That Man who never left college, the one who swam and won to pay for his books... that Man went on and on, and on... into her embrace... as an historian. Now he's gone. All the way down. Just seven days ago.